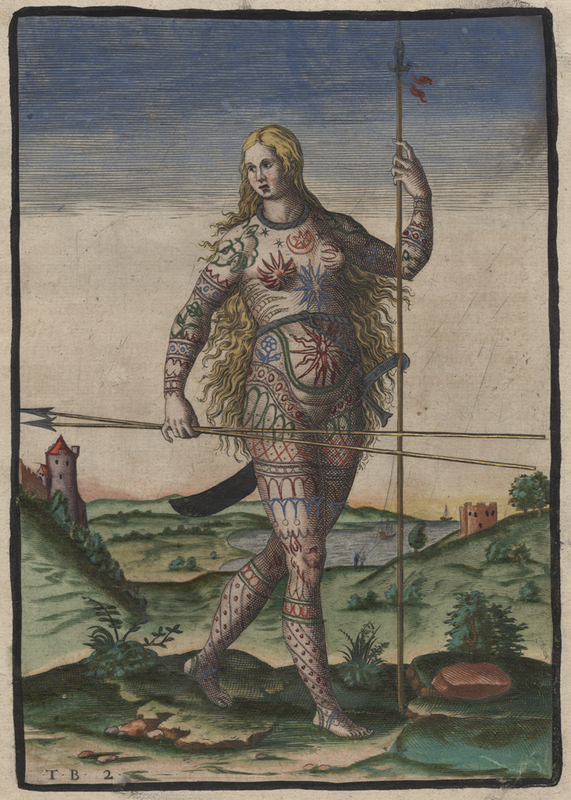 “Hand-colored version of Theodor de Bry’s engraving of a Pict woman (a member of an ancient Celtic people from Scotland). De Bry’s engraving, “The True Picture of a Women Picte,” was originally published as an illustration in Thomas Hariot’s 1588 book A Briefe and True Report of the New Found Land of Virginia . The woman stands with a long spear held upright in her left hand, and two long spears held horizontally in her right hand. She wears only a large ring around her waist, from which a curved sword hangs behind her, and a smaller ring around her neck. Much of her body appears to be painted or tattooed. In the background, two buildings stand on hillsides. It is a rather romantic drawing, typical of the period but I can’t help wondering how the original artist got his information. Another pit to jump into. Just for fun though I will add this illustration by the same person of the lady’s male counterpart. 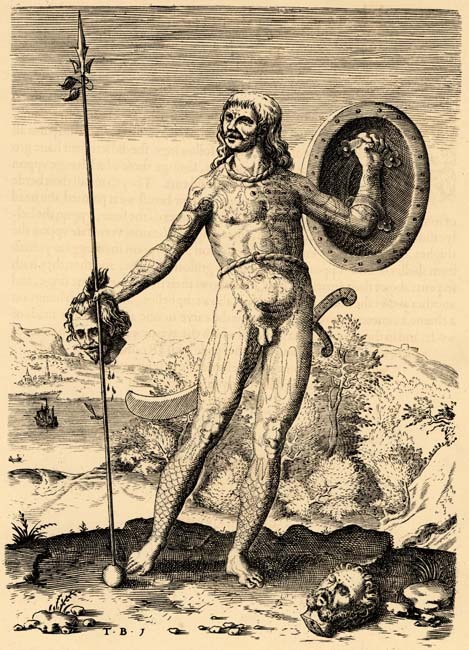 “The Trvve Picture of One Picte.” Theodor de Bry’s engraving of a Pict (a member of an ancient Celtic people from Scotland), published in Thomas Hariot’s 1588 book A Briefe and True Report of the New Found Land of Virginia . The Pict stands with a shield in his left hand, and a tall spear and disembodied human head in his right. Another head lies on the ground near the man’s left foot. The man wears only a large ring around his waist, from which a curved sword hangs behind him, and a smaller ring around his neck. I am not sure why the author would be trying to show the similarities between the two groups of indigenous people, the North American Indian and the Picts of Scotland. 1588 was a long way from the time of the Picts. Was he trying to raise sympathy for the American Indian or have things not changed that much in that there is money in novelty. I think we are all aware of the voyeuristic tendencies of the public perhaps he was trying to exploit that. I reserve judgement. This entry was posted in Researching, Scotland and tagged history, Scotland by Shamwest. Bookmark the permalink.